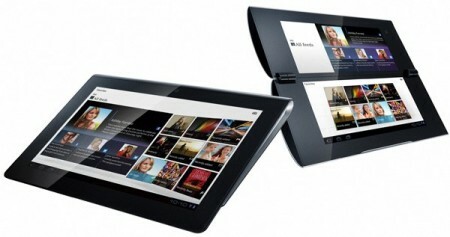 More specs have recently leaked about the upcoming Sony Tablet S and the codenamed Sony S2 which are expected to launch next month. The S2 will launch as the Sony Tablet P, the dual 5.5″ screened clamshell will weigh 370 grams, have 512Mb RAM, 4GB of storage with a 2GB SD card and connectivity over 4G or WiFi. Both the Tablet P and Tablet S will use Nvidia’s Tegra 2 processor and have 0.3MP front-facing cameras. The Tablet S will weigh 600g, have 1GB of RAM and come in 16GB or 32GB flavours. No word on price or exact shipping dates, but it shouldn’t be too much longer before they’re known. What do you guys think of the two tablets and their respective specs? Do you think the Tablet P will flourish or flounder with it’s unconventional design? Let us know below!